← Marisa Ronstadt & The Know-It-Alls at Espacio 1839! 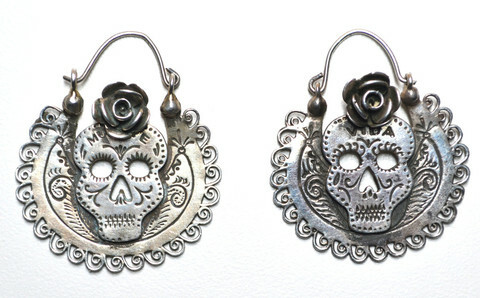 If you make a pledge to our Kickstarter starting today (minimum of $5), you will be entered into a raffle to win these gorgeous Dia de Los Muertos Skull Arracadas Double-sided Hoop Earrings by ilaments (valued at $500)!!! If you’ve already pledged, you can enter the raffle too by adding $5 to your pledge!! You can enter as many times as you’d like (ie: if you donate $20, you’ll get the pledge package worth that amount AND entered into the raffle 4 times)! Raffle ends Tuesday August 27th at 5pm!! Are you ready to win?! Enter NOW!! !